Nets owner Mikhail Prokhorov, the Russian, is presumably well trained in stagecraft and message-coordination. He's a political actor back home on the steppe. He also happens to have designs on acquiring Dwight Howard, the tired superstar, from the Magic. On February 22, your NETS will face off against Dwight Howard and the Orlando Magic. For this one night only the NETS are discounting tickets in the Loud & Proud section to $12! We need YOU there to rock The Rock and give your NETS a true home court advantage! Fans buying tickets must be wearing NETS apparel to show they are loud and proud! PLUS, the first 2,500 fans to arrive at Prudential Center will receive a free ticket voucher to a future NETS home game. 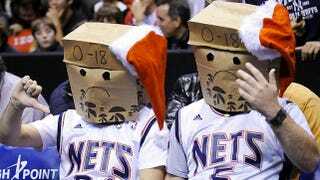 The Nets introduced the Loud and Proud section—where, for all but a few choice games, one can purchase a day-of-game ticket for $20 at the arena if one is wearing Nets gear—last year, and it's actually a commendable idea. It's a way of putting reasonably good seats (the section is floor-level, behind one of the baskets) in fans' (or college-students'-with-nothing-better-to-do-who-went-to-Salvation-Army) hands at a fair price, and we love that. It does look a little fishy, though, when the Nets' coveted target rolls into town and New Jersey thwacks nearly half the retail price off the Loud and Proud deal. "See, Dwight, look. We have fans. They are legion. Don't look at figures which say we rank 29th in attendance. They are wrong. They will be corrected. Plus, we fix everything in Brooklyn. Amazing place. Babies drink cappuccino there. Everyone will love Nets."